While photographing famous landmarks and photo spots is usually a safe way to obtain a beautiful photograph, being able to scout and find own subject to photograph is a skill that many of us have to acquire at some point. Identifying good light, finding the right angle for proper framing and composition, pre-visualizing the end result and using the right tool for the job in order to create a unique and compelling image takes years of practice in the field. This is the area that many of us, including myself, struggle with the most. Despite the difficulties and the challenges, it is important to keep on advancing the “photographer’s eye”. Sometimes we look at a beautiful image and really like it, but have a hard time understanding exactly what in particular attracts us to it. Is it the beautiful light, the composition or the subject itself? An untrained eye often sees certain elements of an image, while neglecting to see other, equally important elements that make an image successful. Being able to see and visualize all the minute details in order to properly execute a photograph is something we all need to continuously work on, because those details really do matter. Personally, I find great help in “dissecting” a solid photograph, to try to understand what kind of thought process and work went into making it. During this process, I pay close attention to everything from light, framing, composition, colors, subject, area of focus and other details, so that I can apply that knowledge in the field. In this article, I would like to present a landscape image that I recently captured in Joshua Tree National Park and go through the process of unveiling everything that went into making this image. Please note that the below article is compiled from some of the chapters from our upcoming eBook “Creative Landscape Photography” that Spencer Cox and I are currently working on. This will be our first eBook, specifically written on the subjects of Light, Vision and Composition when photographing landscapes. 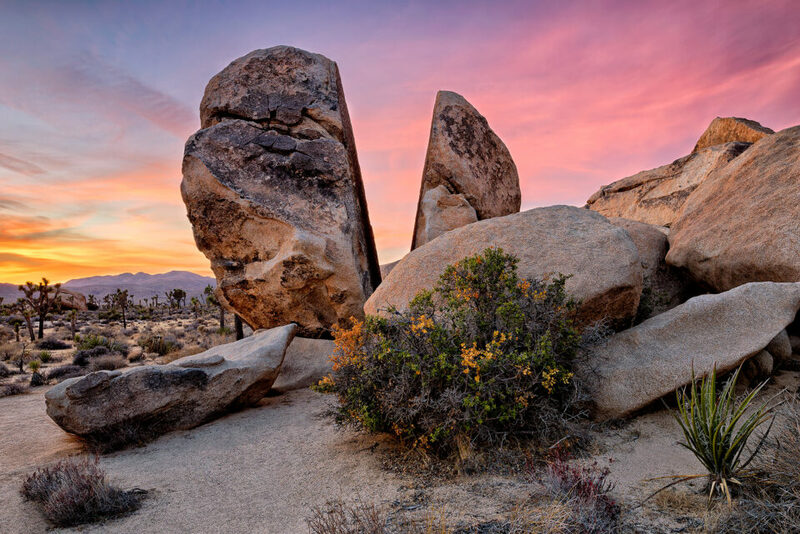 When starting out, many of us often prefer visiting popular landmarks and photo spots, because they serve as a good way to practice our photography skills and provide more or less guaranteed results. These are the “safe shots”, because we already know where to go, when to show up, how to shoot, how to frame and what type of light we can anticipate based on research, or feedback from others. Sometimes we see a picture of something stunningly beautiful and we want to know where and how that particular photo was taken, because we are naturally drawn into wanting a similar one of our own. There is absolutely nothing wrong with that, because many of us don’t have the time, patience or skills to find unique subjects every time we decide to take a picture. Plus, with so many people with cameras out there, chances of finding a truly unique subject and perspective are getting smaller every day. Even when we think that we have captured something for the first time, chances are, it was probably already done before by someone else. Does that mean that we should be discouraged from seeking the unique? Of course not! In fact, the best way to flex your creative muscles is by scouting and searching for something you have personally never seen or done before. Whether someone else has already done it or not is irrelevant at that point, since it is your subject, your planning, your framing, your composition, your gear and your post-processing. It is your photo in its entirety. Interestingly, when we do manage to find a unique subject or a perspective for a photograph, we often take pride in those images. We feel a special connection, because we know that the image came out as a result of our own creative vision. How do we seek the unique then? In landscape photography, it is all about scouting – one must be ready to put a lot of effort into searching for the right subject, identifying the time to photograph it and decide on what equipment and technique to utilize to get the job done. During my last trip, I made the decision to drive to Death Valley NP through the southern route, spending a couple of days at the Joshua Tree NP. 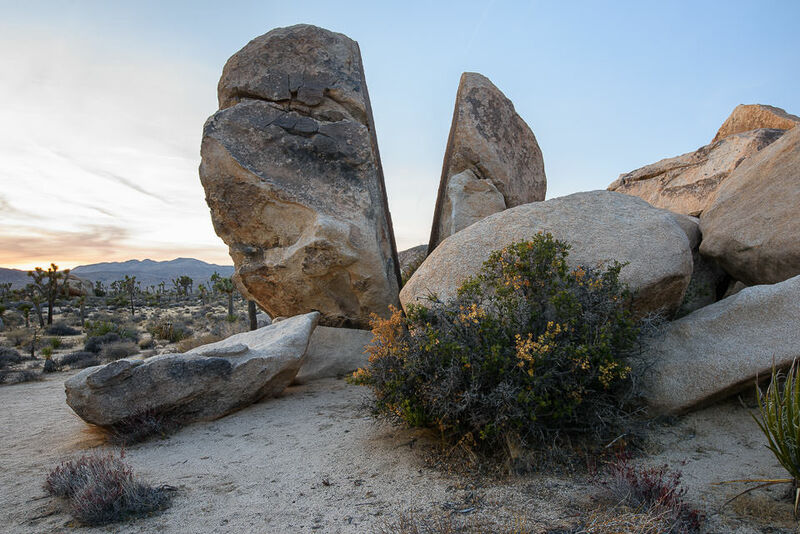 I had never been to this park before, so aside from seeing a lot of Joshua trees, I had no idea what to expect. With my good buddy Tunc, who accompanied me from New Mexico all the way to Death Valley, we entered the Joshua Tree NP from its southern gate late at night. It was a pretty long and tiring drive, so by the time we found a camping spot, we only had a few hours left to get some sleep. Waking up in the morning was a challenge, but we had about 25 minutes left before sunrise. As we drove out, we saw a stunningly beautiful formation of clouds and the sun rays were already reaching them, painting them in deep red colors. We drove no more than a mile, desperately searching for something to shoot. We were in a “panic mode”, because both of us did not want to miss that beautiful and rare blood-red sky. After a week of no colors, it was the first time we were greeted with such beauty and we were about to miss it! It was a good lesson learned. Instead of rushing through the panic of losing light, if I had slowed down and focused on my subject and composition in the first place, I would have probably done better to begin with. So keep this in mind when you face a similar situation: slow down, breathe and put some thought into what you are doing, instead of desperately trying to find anything interesting to photograph. Still, that was not really the problem – I was simply unprepared. So I decided to spend the rest of the day scouting for good photo spots that I could come back to. 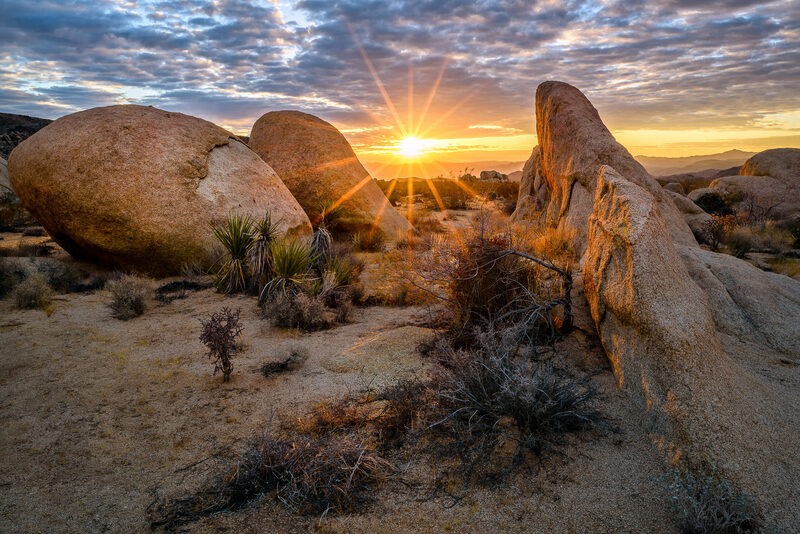 Joshua Tree NP is a huge park and there is a lot to see, but given how little time I had (1 sunset and 1 sunrise opportunity), I knew that it would be difficult to find something solid to photograph. 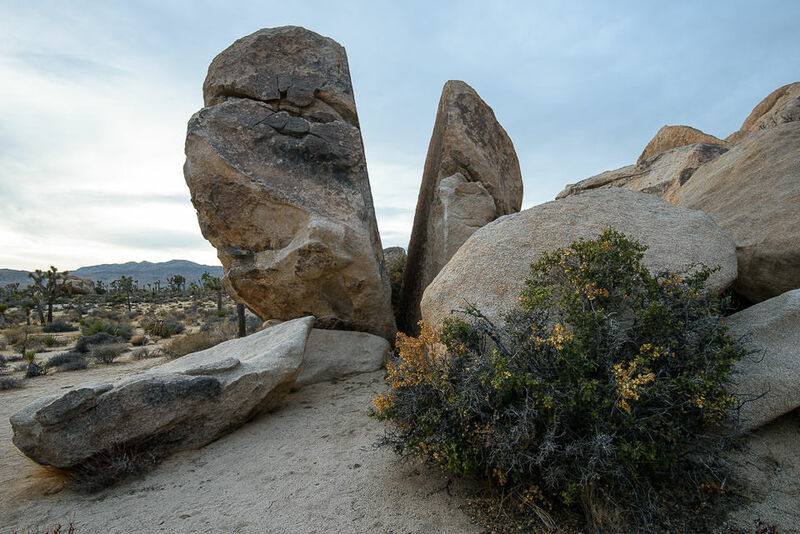 While Joshua trees are the obvious highlight of the park, I really fell in love with the beautiful rock formations that can be found all over the place. Millions of years of flash floods, strong winds and natural erosion really shaped out rocks in this area, which for me quickly became them the main attraction. After a long day of scouting, we decided to stop by an area called “Hall of Horrors” and hike it for additional photo opportunities. 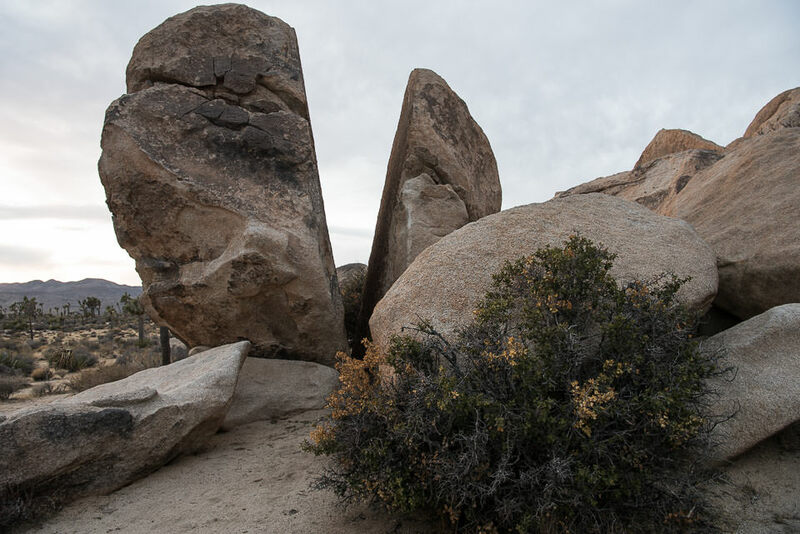 The area had lots of Joshua trees and rock formations, so we figured it would be a good area to check out. Plus, with only a few cars in the parking lot, it was not as busy as some other areas of the park. We had about an hour left until sunset, so we had a bit more time on our hands than in the morning. 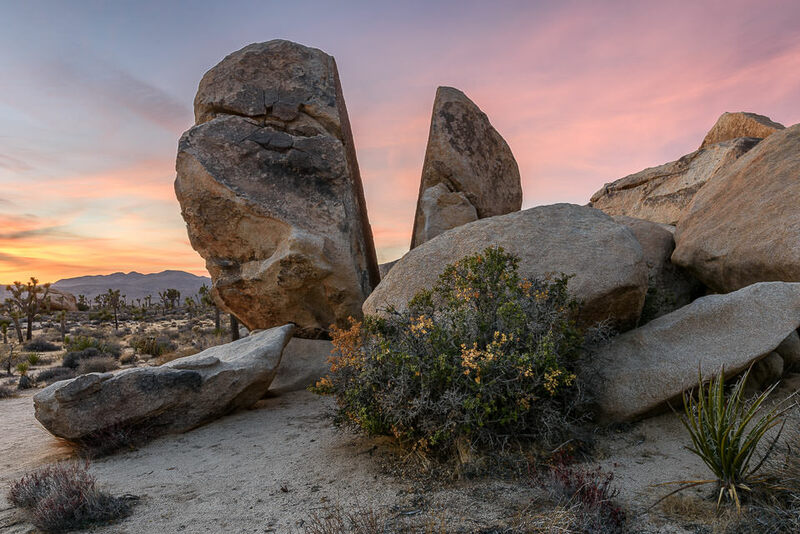 In my mind, the worst case scenario involved photographing Joshua trees by themselves at sunset, so it was a “safer” area to spend the evening at, given the circumstances. 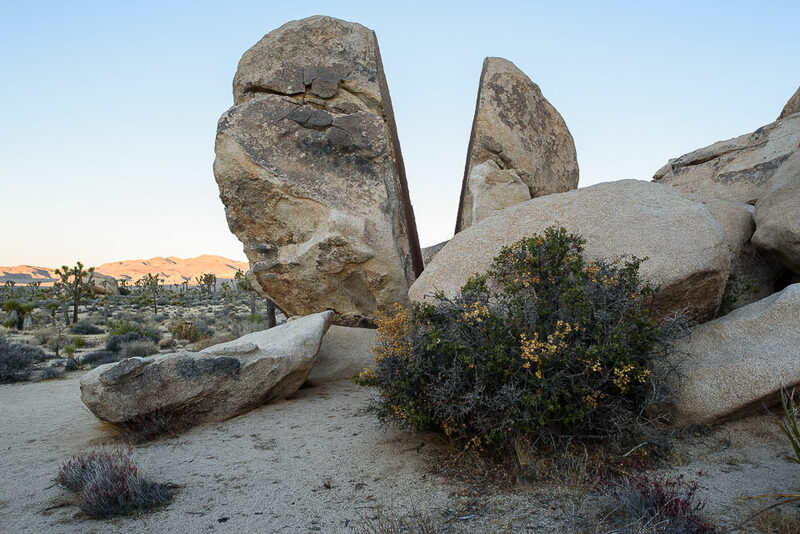 The spot was clearly a sunset spot, because the other side of the area where the sun comes up during winter months is completely blocked by huge formations of rocks. It meant that we would not have an opportunity to photograph it again the next day, since our schedule was to head to Death Valley the next morning. After spending 10 days in Death Valley, I decided to take exactly the same southern route home. I really wanted to re-capture the same split rock in good light and I was determined to do it. The weather forecast called for some clouds and I was not about to miss another opportunity. I arrived at the spot right at sunset and now it was all about the light. Photography is all about light. As John and I highlighted in our Level 1 Basics Course, there is no photograph without light. And you cannot take a great photograph without great light, because that’s what shapes it up – light and the correct use of it, is the “secret ingredient” behind every successful photograph. Whether you are looking at a scene with a breathtaking sky filled with colorful clouds, or a dark, gloomy scene with black stormy clouds, it is the light that makes it all possible. For this reason, we put a lot of emphasis on the importance of light in both our basics course and the very first chapter of our upcoming landscape eBook. 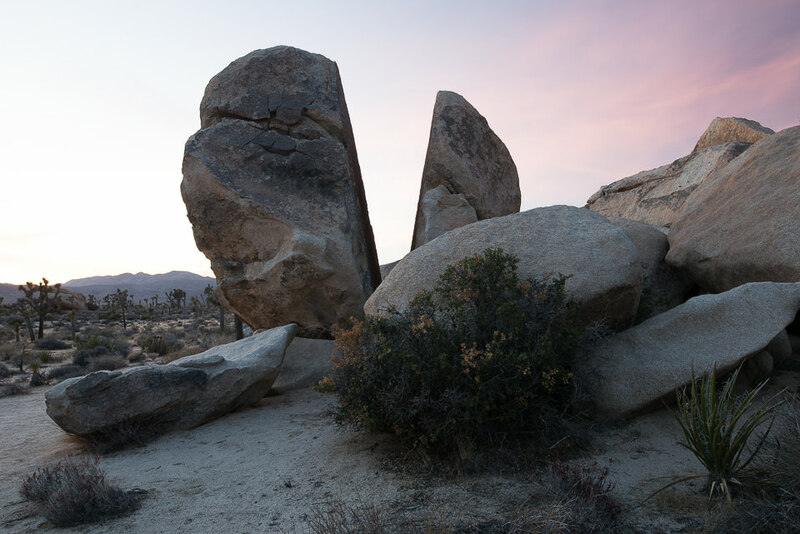 Sadly, despite the promising weather forecast, the sky at Joshua Tree NP was pretty clear at sunset. Not a single cloud in the sky in the direction I was facing! I took some other photos of the surrounding areas where there was a little bit of cloud coverage and decided to stay one more day, in my final attempt before departure. Since I was only fixated on one particular composition, I did not bother driving around to other places. I woke up early and decided to see if it was worth coming to the spot at the blue hour. Sometimes, the blue hour can be very rewarding, because if the horizon is clear and there are clouds in the sky, it will cause beautiful light to spread all over the sky way before sunrise, thanks to clouds reflecting light on each other. I knew it was time to go, because by the time the sun rays would reach the rock, the light would have been too harsh to work with. Plus, without any clouds in the sky, there was really nothing to complement the scene. It was time to go…my last chance was at the sunset. By then, it was my fourth time coming back to the same spot. It can be a frustrating experience, going back to the same place over and over again, but that’s what you get with landscape photography – you are always in the mercy of light. But my patience did pay off at the end, because I was able to capture exactly the image I originally envisioned in my head that one evening. Right after sunset, I was lucky to get beautiful pink and yellow colors in the sky. Before I captured the shot, however, I went through a number of considerations and that’s what I want to talk about next. So what attracted me to this particular rock? Why was it something I wanted to come back to and capture in good light in the first place? Let’s talk about the image now and go over some of the thought process that went through my head. While light is extremely important, the subject of your image is next in line in terms of significance. When assessing a scene, one must pay close attention in identifying the primary subject, because that’s where viewers will be focusing their attention on. In every photograph, there is always a primary subject. In most cases it is usually a single subject, but there are cases when the primary subject is comprised of a group of subjects. For example, if you photograph a forest, the primary subject can be the trees of the forest. However, if one of the subjects from the group is overwhelmingly large in comparison, then it automatically takes on the role of the primary subject. In the case of a forest, if one of the trees is massive in comparison to all other trees, it becomes the primary subject, because it will automatically shift the attention to itself. Why is it important to identify the primary subject? Because the composition needs to be framed to accommodate the primary subject. In landscape photography, it is rarely a good idea to cut into the primary subject, block it by secondary subjects or move it too far off towards the edges of the frame, because the primary subject is too important. Composition usually gets heavily influenced by the primary subject. Now here is something I always highlight in my articles and workshops when talking about composition – the sky and the clouds in the sky can almost never be the primary subjects in landscape photography. The sky could be stunningly beautiful, with colorful clouds all over it, but it cannot be the primary subject of the photograph. That’s why photographing the sky by itself is usually pointless. Now notice that I used the word “almost” in front of “never”: there are obviously exceptions to this rule. There are cases when the sky can contain a dominating element in the scene. An example of a dominating element in the sky could be the Milky Way, or a large, stormy cloud formation with a very distinct shape. In such cases, it can be acceptable to build up other subjects and elements around the dominating primary subject in the sky. Next are secondary subjects. They can be represented by other important elements of the scene. 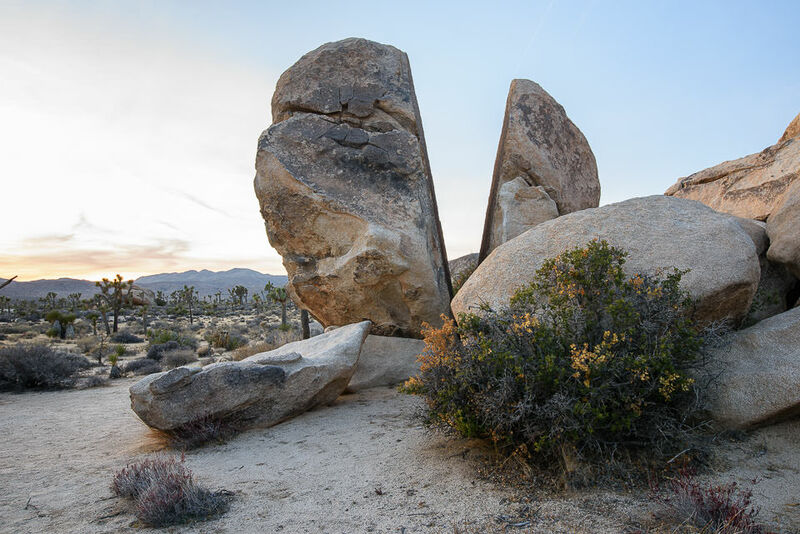 Smaller rocks, trees, clouds with defined shapes, plants and other larger vegetation can all serve as secondary subjects. Ideally, one should not cut into them or block them either, as they are the supporting elements for the primary subject. However, when there is no choice, it is acceptable to do it, as long as the primary subject dominates the scene so much that the secondary subjects become more or less insignificant. Images can also contain tertiary subjects. These are smaller, less significant subjects in the scene than the first two, but also serve a purpose to complement the primary and the secondary subjects. While ideally one should strive to include them in the frame for a more “complete” composition, it is often acceptable to cut them or put them close to the edge of the frame. 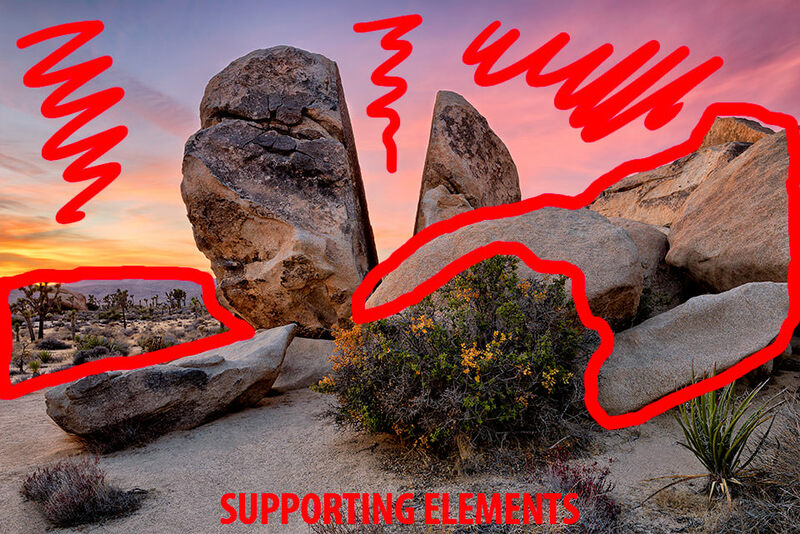 Lastly, there can also be supporting elements. These are usually “fillers” to complete the composition and they can take pretty much any form. Water, snow, sand, clouds and the sky are usually supporting elements. They can be cut into or blocked by other subjects in the scene, because they are not as significant as the main subjects. When identifying subjects, it is important to highlight that primary subjects rarely look appealing by themselves, without the supporting secondary or tertiary ones. Secondary subjects are extremely powerful, because they can give a sense of scale or help balance the primary subject in the scene. Tertiary subjects can act as other smaller, less significant elements in the scene to provide additional support for the first two. However, one must take caution when introducing too many subjects – if a scene contains too many elements, they can potentially compete with the primary subject and overwhelm it. Although it is not the second largest subject in the scene, it stands in front of the large rock, basically overtaking it. The secondary subject has a very important role here – it helps balance the primary subject (more on balance below). It has a similar circular shape as the primary subject and it also has different colors than everything else in the scene, making it stand out from the rest of the group. From this group, the sky and the clouds are the main supporting elements, because they dominate most of the framing in the image. Now that we have identified all the subjects in the scene, let’s move on to composition. Without a doubt, composition is one of the most critical aspects of landscape photography. A scene can contain beautiful light and a very appealing subject, but without solid composition, it will not have the visual appeal. In fact, weak composition is capable of reducing the overall impact both light and subject can play in the eyes of the viewer. 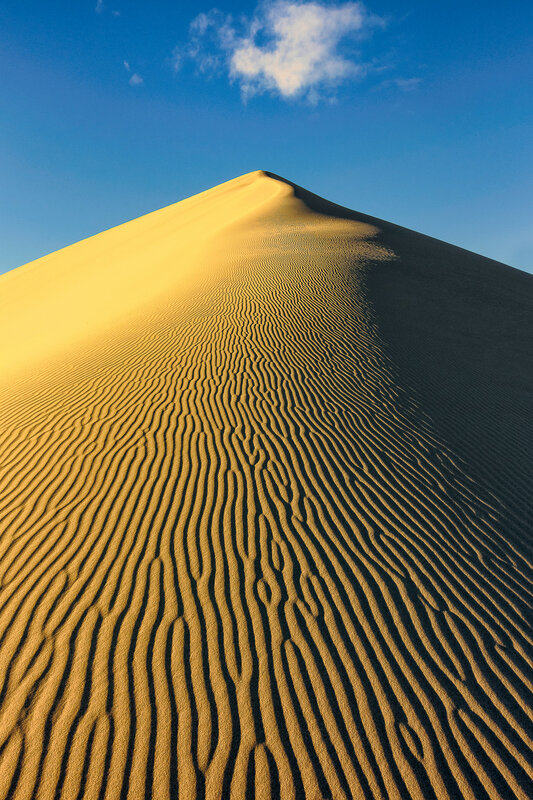 In contrast, solid composition has a reverse effect of enhancing and boosting otherwise less appealing subjects – in some cases, composition alone is capable of making an image successful, even when the light and the subject(s) aren’t as visually strong. When I scouted the location and found the subject I wanted to photograph, I had to carefully decide how I would compose the image. Many considerations went through my head as I moved around the rock. I had to think about where in the frame to place the rock, what elements to include or exclude as part of my composition, how large to make the rock appear in the frame relative to other objects, how much of the sky to include, what part of the frame to anticipate the sun or the clouds to be in, so on and so forth. Keep in mind that although we already went through the process of identifying secondary and tertiary subjects, along with the supporting elements of the scene, composition and framing both played a huge role in shaping up all of those. This composition works for a number of reasons. First, the “V” slices right through the middle of the frame, forming a beautiful reverse triangle. The rock on the left bottom of the frame creates another line that leads the viewer from the left bottom of the frame to the primary subject. Another imaginary line from the right side of the frame can be drawn to the center, making this a proportional composition. The larger side of the sliced rock on the left works out perfectly, because it helps balance the right side of the frame that feels heavier in comparison. Also, this composition allowed me to frame the image in a way that resulted in the least amount of damage to the “V” area of my primary subject, without cutting into it. I really liked this composition and thought that I would settle with it. To me, this looked like a better composition, because my primary subject was dominant, the secondary subject nicely balanced its left side without competing with the primary subject and all the other subjects were complete, nicely complementing the split rock and the foreground. However, I did end up sacrificing in some areas. Mainly, I was cutting into the sliced rock, which is something I wanted to avoid. Unfortunately, without moving up to a higher vantage point, there was no way around that. And if I did that, I would have cut into the “V” even more through the rock behind it anyway, potentially making it look worse. Lastly, I wanted to show an equal amount of the inner side of the sliced rock as in the compositions above. Unfortunately, that also turned out to be an impossible task – as soon as I moved a little to the left to adjust the perspective, I ran into the problem of chopping off a portion of the yucca on the bottom right. Despite these sacrifices and compositional deficiencies, I decided to keep this particular framing. I wish things were situated a little differently, but when you deal with the nature, you have to often deal with such challenges. When photographing landscapes, I try leaving as little footprint as possible and for me, cutting down things and moving them around is not an option. Choice of center composition, by placing the “V” shape that separates the two parts of the primary subject into the center of the frame, allows for division of the image into two equal parts, which creates visual balance. The alignment of the rock on the left bottom side of the frame, along with the framing of the foreground creaute another invisible triangle that leads the eye from the bottom sides of the frame into the center, adding to visual balance. The secondary subject, i.e. the large bush in front of the rocks helps counter-balance the left side of the frame both in terms of colors (yellow colors of the sky) and the left side of the sliced rock. 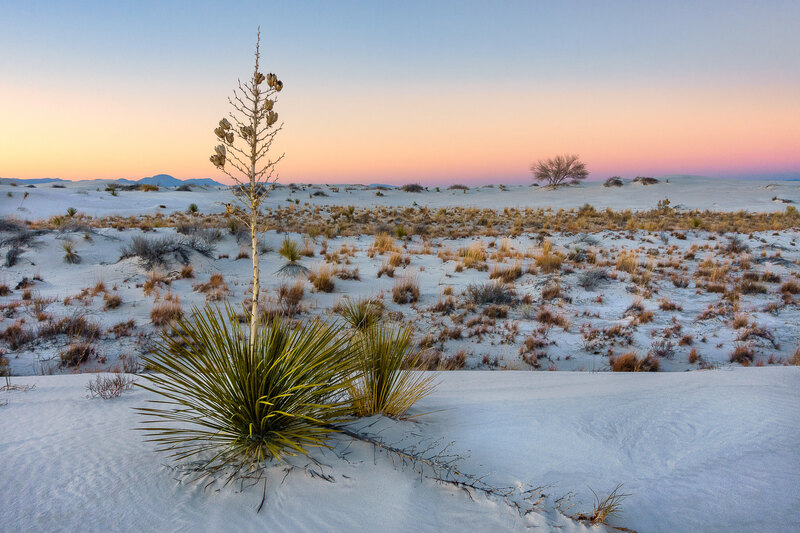 The bush on the left bottom frame helps counter-balance the yucca on the right bottom frame. However, things are not balanced perfectly. The image still feels a bit right-heavy, because of the large rocks on the right side of the frame. It would have been perfect if those rocks were not as overwhelming and if the rock on the bottom right side of the frame was not as long and pointy – I would have preferred not to cut it. Still, given the circumstances, I believe I achieved the best possible balance in this shot. Once the hard work with identifying the subjects, setting up composition and framing were done, it was all about waiting for the good light to finally capture the image. That evening I was blessed with some beautiful colors in the sky, which allowed me to capture the beauty in its glory. However, shooting proved to be a rather difficult task. With the sun setting to the left side of the frame, I had a very difficult sky to work with – it was excessively bright on the left side of the frame. I excluded the option of using a graduated neutral density filter, because I would have ended up darkening the sliced rock and the bottom left side of the frame. My solution was to fire 3 bracketed shots 1 EV apart, with the left bracket exposing for the sky on the left side of the frame and the right bracket exposing for the shadows in the foreground. I figured I would either recover details using HDR in Lightroom, or manually blend the exposures in Photoshop. In terms of camera settings, I used ISO 100 on my Nikon D810. I started out as ISO 64, but due to my use of bracketing and the cloud movements, I decided to keep my shutter speed a bit faster. I quickly calculated the hyper focal distance (which I did by estimating the distance to the nearest bush, then doubling that distance), set my focus on that area (which was approximately around the laying rock on the bottom left side of the frame), then stopped down the lens between f/8 and f/11 for best sharpness and maximum depth of field. Everything was set up on a stable travel tripod – I used my Gitzo Traveler with the RRS BH-25 head for the job. I also set Camera Calibration to “Camera Standard”. I could have made similar changes in Lightroom, but it would have probably taken me more time, since spot healing and adjustment brushes are frustratingly slow to work with. Identify the type of composition used. Do the images balance? Identify the balancing elements, as well as potential elements that might be breaking the balance. Vitalishe, glad you’ve enjoyed the article! Super tutorial! I really enjoyed reading this (and so many other on your site). One question though….you say “I quickly calculated the hyper focal distance (which I did by estimating the distance to the nearest bush, then doubling that distance), set my focus on that area…” Isn’t the HFD half the distance from the nearest subject and not double? Thank you Matt! Depth of field is everything from half the hyperfocal distance to infinity. That half is your nearest subject you want in focus. So if you have a rock located 5 feet away from you, the hyperfocal distance is at 10 feet. That’s why you estimate the distance from the camera to the nearest subject, then double that distance to get the correct hyperfocal distance. Hope this makes sense. Excellent article, I find how you compose the picture enlightening, Mother nature makes you think when it comes to what you are willing to compromise on when compositing a picture. Altering the landscape by removing vegetation or rearranging or removing rocks to enhance a picture is as bad as a golfer moving a golf ball to get a better shot at the green. The post processing that you do is the fascinating and changes a good photograph into a outstanding photo. that is my weak point, but I just keep plugin along. Spencer Cox’s article about the different features Lightroom develop module has been helpful. It is a never ending learning experience with lots of trial and error. Patrick, always good to hear from you my friend! I agree, altering vegetation, rocks and other objects isn’t landscape photography anymore – that’s simply unethical. If everyone does this, we will have nothing left to photograph, because each person will see things differently! We should do our best to leave nothing but footprints (actually, it is best to not leave footprints either, LOL). Glad you are enjoying the articles. We will work hard on keeping them coming! Any plans to visit the San Juans this year? Nasim, yes will be there this fall, planning to travel from the Tetons along the divide through Colorado, or do it in reverse depending upon how the fall develops. Good chance I will be in the San Juan’s about the same time you will be there. Excellent “deconstruction” of a how you arrived at a fine final photograph. Thanks again for all your effort in making a difficult subject more approachable. Jim, thank you for your feedback! Thank you Nasim, for an enlightening article. It is articles such as these, that focus on composition and the thought process behind an image, that help teach photography more than any gear review can, especially for budding photogs. I read more books on composition in the last 6mo than in the last 6 yrs combined, and it has made me much more deliberate and thoughtful. Your tale of rushing around that first morning resonated with me because I used to do the exact same thing. Because I am not a pro, my time behind the camera is limited. As such, I used to jam pack my trips so I could visit all the highlights. Your lesson in using “down-time” to scout, work a subject, and dedicating time to return for better light, is valuable because it is next to impossible to produce portfolio-grade work of many subjects just by visiting a large park once. Being deliberate, seeing the image in your head, and being able to produce it in camera and in post, has made photography infinitely more satisfying than running around a park, snapping away, and leaving it up to luck. Your article is perfect in illustrating the creative, physical, and logistical efforts needed to produce work of your calibre. KomradeKiev, thank you for your feedback! I have been wanting to write articles likes this for a while, but haven’t had the chance – part of the reason is, it takes a long time to compile them together. Glad you found value in the article! Thank you for the very nice article. Oh, and stunning pictures. Thank you David, I appreciate it. Glad you’ve found the article useful. Amazing article! This is going to improve my landscape photography for sure. Silent Spike, thank you for your feedback! I will be honest, I did not spend much time with the editing, which I should have probably done. I normally don’t do HDR photography, so it was interesting to see what Lightroom would do with a quick edit. I think my next trial is to see how that would fare to exposure blending from multiple images instead. I don’t like the halos that HDR typically adds, so I will have to play with it more. You are most welcome Monte! Thanks for an interesting and informative article. I thoroughly enjoyed reading it. Now I’ll be looking for chances to apply my newly-found knowledge. Romaine, glad you found the article useful! Amazing read. Thanks a lot for sharing and educating :) Have a good day. You are most welcome Braj! I really love this blog because or articles like this. I really enjoyed reading your thought process. We always love hearing others validate your own methodical process and you definitely gave me more confidence. Also, I believe I could learn alot about landscape photography from you. Here is why. I generally follow your process but I run into trouble often in one particular area and it’s detrimental to my results. It goes wrong for me often when deciding what elements to include, taking away from the overall impact of the image. It is all about balance for me and I know I could dramatically improve my landscape photography if I could further refine my decision making in this regard. It proves that no matter how long you do something (and you know you do it mostly well) there is more to learn. I do a much better job with portraits and wildlife, but have a great desire to improve my landscapes. Finally, I know improving in that area will improve my compositional skills in general. I am interested in your upcoming course on landscape photography. Sceptical, glad you’ve enjoyed the article, thank you for your thoughts and your feedback. As always, great to hear from you. Beautiful photographs and very interesting and practical lessons to be taken away. Please let us know more details about the book that you and Spencer Cox are drafting when it becomes available. As always, thank you for the great work provided by you and your team. You are most welcome Benji! We will post updates as we get closer to getting it published. Also these are great shots! Thank you Zac, appreciate the feedback! Thank you for your feedback! Glad you enjoyed the article. Very exciting reading, an adventure you take us on. On composition: one thing I noticed immediately was the diagonal formed by the supporting rocks, from upper right to left below. As you never mentioned this I guess diagonals aren’t as important as I have learned (from books) in the past. One other thing is that Camera Standard doesn’t work for me at all, it produces nasty blue and orange stripes at the border of light and dark on e.g. an arm of the model. When I choose Adobe standard all is well. I wonder why this is, maybe it is because D610 isn’t supported? Picture control is on STD. Hans, diagonals also work great for composition, but in this particular case, there is only one diagonal, which does not bring much balance, as stated in the article. If there were more rocks to the left of the “V”, it would be a great example of two diagonals. As for Camera Standard, that all depends on what you shoot and what you shoot with (Camera Standard works differently with each camera model). It does not work for me when shooting portraits, but for landscapes, it is a good place to start. Excellent article. Your emphasis on scouting is extremely important, and often overlooked. This week I’ve been using maps to scout the places I want to scout! 1. The pictures you took are the sort that do well with single image sales to a single, high paying customer, perhaps yourself. The large amounts of time required means you must sell at very high prices, or else “pay” the equivalent in your own time. When you have a day job you know exactly what this is; it’s losing vacation days you earned by hard work. 2. I expect the pictures in this article would do well with decorators who buy large quantities of art for placement in hotels and offices. The problem here is accumulating the very high volume this market requires. For those interested in the last market you might want to run a series on shooting in bright sunlight and still getting compelling colors. I don’t often comment but just wanted to add my thanks to that of the others here. As an engineer I’m great at digesting the “technical craft” of photography, but I have to spend a lot more time working on the “creative art”. This article is a beautiful breakdown of how to select and balance a composition that I know will help my photography immeasurably. Thanks for going to the effort to pull it together. There’s a lot of work in there, must have taken you ages!! Can you give me a more detailed instruction on how to fine the location of the split rock in your photo in Joshua tree NP? We will be there soon.